John Yamasaki @jyamasaki on Twitter joned the Seesmic team as a Community Evangelist. Congratz Yama! Stepahnie Agresta joins Porter Novelli as the EVP and Global Director of Digital Strategy and Social Media. Big congrats, and glad she made her blog post about the topic ‘human‘. I’ve known her for a few years now, and am happy to congratulate such a warm, intelligent, and fantastic professional to such a key role. Wishing her the best. This one is a shocker, Steve Bendt who lead some of the innovative social media efforts at retailer Best Buy has decided to join Microsoft, (Catholic guilt and all) his new title will be Social Media Marketing Manager on the Windows team. He’ll be starting in Redmond in early July and I’m sure they’re glad to have such an innovative professional. The Super Rewards team is happy to announce that Julie Craft, has recently joined the team as the Vice President of Marketing and Publisher Relations. I can’t say enough good things about Adam Singer, who is a talented electronica muscian (I’m a fan of his) has decided to TopRank as an Account Manager to serve clients. Congrats on Top Rank who hired a very creative professional that will take them to the next level. Adam be sure to keep up the music! Ripple 6 makes two key hires with Paul DePinto assumes the position of Vice President of Sales East.and Mike Tracy was promoted to Vice President of Sales West. Anthony Cerreta is the Lead Interactive Producer for matrixx. Their recent projects include campaigns for Johnsonville, Schlotzsky’s, and Dippin’ Dots Facebook Fan Page, find him on Twitter, and his blog. InfoGroup hired Bryan Jennewein is now Director of Social Media, find him on LinkedIn too. Did you submit but it’s not showing here? That’s because I need a URL to link to as final confirmation. I get a lot of books across my desk. Very few I get the chance to read, and very few I think are wonderful. 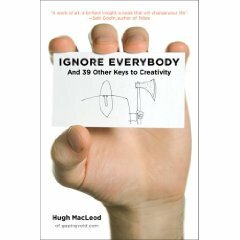 I was smiling ear to ear on a recent plane trip when reading a book written by cartoonish Hugh MacLeod, someone I’ve met several times and enjoyed reading his sometimes odd –yet insightful blog for many years. You see, his book Ignore Everybody, really isn’t a book. Instead, you should think of it as as that friend in high school who never followed the rules, but achieved his goals took you out for a beer 20 years later and shakes your shoulders and wakes you up. Hugh’s book is about creativity and inspiration, how you should draw this energy from within –not from group think, or cubicles, or existing standards. Like those having a beer –or two– with an inspirational old friend, his book is easy to read on a short flight, and contains his irreverant cartoons. If you’re reading my blog, you’re likely pushing the limits of creativity of the digital space within your career (just as I like to do too) and this should be a book to grab and keep close to the heart. I give Ignore Everybody 4.5 stars out of 5 stars, which matches it’s soaring amazon ranke of #38 in just three days. Or, in the spirit of the book, “F-that”, don’t listen to me, go buy it and tell me what you think, and write your own review. Left: This screenshot, provided by Digg shows how an EA Sims ad is embedded in main body editorial as sponsored, as well as in upper right bug. Interactive Ads aren’t new, Facebook launched ‘Engagement Ads’ (analysis) nearly a year ago, and community vendor Pluck and agency Razorfish followed suit, in similiar vein community platform Kickapps launched WidgeADs. Pricing based on ad performance isn’t anything new, we’ve seen this with demand and supply of ads for years with cost per action. Homogeneous : Community ranked ads will likely work better in homogeneous communities where there’s a common interest or demographic, rather than a large broad community where consensus won’t be found. In the case of Digg, I’d make a guess from watching the community that it’s a lot of Gen X and Y males that are technology optimistic, and liberal. Having spent time at the live Diggnation event (the super fanboys, photo by Brian Solis) it could be a representative sample. Engaged: Community ranked ads make sense for the Digg community as they are already highly engaged in voting for stories, as well as the very active comment (over 100 comments is norm per article on front page). Transparency: Dislcosing in the editorial stream that the ad is sponsored. Gaming: Expect gaming of the site, not from marketers, but from fan boys, perhaps those that love Apple products will bury Microsoft ads. Since you must have a registered ID to vote on items in Digg, the chances of the advertiser influencing the ad price will be limited. Unusual engagement: Expect that most users are more likely to bury ads, not engage with them and promote them. However, if a user buries an ad they don’t like, this cost per action is still an engagement, which is higher than not paying attention to them at all. If this works, Digg or it’s partners could replicate this product and extend to other sites. Interactive advertisers like Federated Media would do well to open discussions with Pluck and Kickapps, who have a strong media focus. For brands and advertisers this is a great way to find out why an ad may not work for a particular community, rather than make guesses based on CTR performance. Advertisers that analyze or even engage in the dialog may benefit their next generation effort. In the most ideal sense, community preferred ads become information and content –not invasive content. Digg is a very unique case study, and if these ads work here, it will be hard to replicate on other communities, a unique mix of a very engaged community that is somewhat homogeneous will be required to make this work. Let’s see how it unfold.